December is a gift to hikers drawn to Mount Diablo, the peak dominating the East Bay landscape. Limitations: No dogs on trails. Camping: $20, May 15-Sept. 15; $15, Sept. 16-May 14. Reserve a site at www.reserveamerica.com or (800) 444-7275. No backpacking. Driving directions: South gate – From I-680 in Danville, take the Diablo Road exit and go three miles east to Mount Diablo Scenic Boulevard. North gate – From I-680 at Walnut Creek, take Ygnacio Valley Road east and turn on Walnut Avenue, stay on it to North Gate Road and drive into the park. Mitchell Canyon – From I-680 at Walnut Creek, take Ygnacio Valley Road to Clayton Road. Turn right on Clayton Road and right on Mitchell Canyon Road. Regency gate – From I-680 at Walnut Creek, take Ygnacio Valley Road east to Clayton Road, turn right on Clayton Road, and right on Marsh Creek Road. Turn right at Regency Drive and park at the end of the road. It’s a month when occasional rains wash smog from the sky and open amazing vistas (you’ll see snowcapped Sierra peaks on the best days). A hint of green returns to the state park’s hillsides, but the thirsty ground absorbs most of the moisture, so the trails lack the ankle-deep muck of the later rainy season. The Diablo summit area has great views, easy trails and a nice museum. It’s a natural starting point, but there’s a lot more park beyond the peak. Trails twist through rich oak woodlands and rocky canyons. The Rock City area has some of the most curious sandstone formations in the Bay Area (copiously decorated by industrious delinquents, alas). 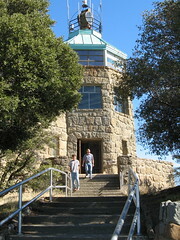 Being a mountain, Diablo practically begs you to climb it, floor to ceiling, from near sea level to its 3,849-foot peak. Do it if you must, just be mindful of the mountain you’re missing on the way to that tiny bit at the top. Standard precautions: Watch for poison oak, and watch your step in Rock City. High winds at the summit can make it icy cold in winter. Be prepared for steep and rugged trails. Buy a map at the park entrance. Easy: The Fire Interpretive Trail encircling the peak near the summit is among the prettiest paths under a mile in the region. Mostly flat, with excellent vistas. Moderate: The Trail Through Time at Rock City has tricky footing on the way to Sentinel Rock on one end and a walk through a quiet wooded canyon on the other. A nice six-mile out-and-back takes Trail Through Time from Lower Rock City to Devils Slide Trail to Knobcone Point Road and out to Balancing Rock, a large stone precariously perched on a hillside. Retrace your steps on the way back. Hard: Summiteers have loads of options. An obvious choice is a 13-mile, three-peaks route to Mount Olympia, North Peak and Diablo Summit. Get a map, and chart your route from the Regency Gate in Clayton. It’s a beast, but worth doing once.